yes...always in a sing-song manner. but she still seems to only talk in vowels. i think so...since she plays peek-a-boo with us. somewhat..i should give her more practice eh? They say your life changes with the arrival of a new baby. Everyone knows that. All mums live that change. I would personally feel that it doesn't change as much for dads as it is for mums. Somehow, as mums, you're always thinking of your child. (more than in the initial stages of a r/s when girl and boy meets). While we work, our minds and hearts is with our baby/child. That overflowing love is so natural. Went for lunch with my dad & sis...and a little bit of shopping after that. For once we decided to try the Beco, back carrying position...Eliza's like a lil koala bear...but we decided the front carry one is better as we can see her, but it was a fun try. Lunch after church last sunday, this time a Bedok Botak Jones. 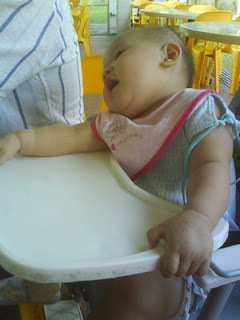 this was more challenging as Eliza was not due for her lunch yet and i had to keep her entertained. here's Eliza...bored. Fun toy at church cry room...actually after sitting on it for 1min, she was trying to get out of it, not in an unhappy way but her legs just wanted to go somewhere else. 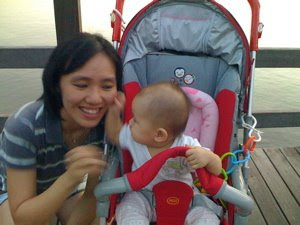 Last Saturday, before we went to a wedding..i wanted to take a pic before we go...but Eliza was busy eating the strap of the Beco, wondering why mummy & daddy must take photos, AGAIN. 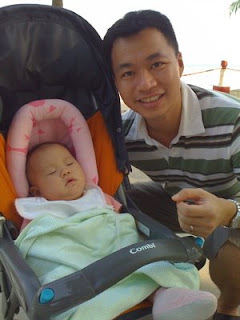 The same saturday, we went for a walk to Bedok reservoir...i can tell Eliza enjoyed it. here's Eliza checking me out. she likes to put her hand on our cheeks, mouth, nose...and touch or occasionally scratch us. Love this pic of Eliza. Out of the many many photos i tried to take this is one of the clearer ones. 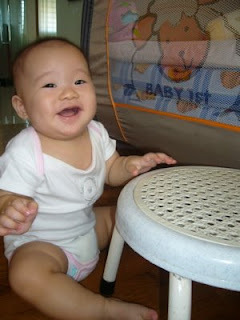 Her photos are always characterized by blurness as she keeps moving and jumping in joy. so i happily snap away...and daddy was on the way to break into a bigger smile. This rented exersaucer has been a lifesaver for all of us as we could safely put Eliza in, and leave her to play while we can do chores or eat dinner. She has been enjoying it for 3-4 months already and she has her own ways of having fun while she's there...one of it is throwing her toys and 'eh'-ing us to pick it up for her. 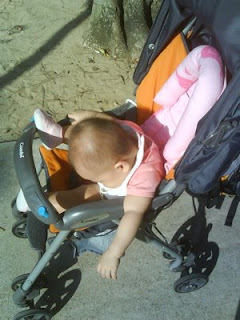 I realized that a good playground for Eliza is the floor! Now that she crawls, or more like slithers, she's more confident on moving about on the floor, which explains why she has lost interest in sitting in the exersaucer. Caught her trying to get out of the room! Just a week ago, the Bumper mat i got from the BP arrived! it's been a long time and i have put off getting it for a long time as well. It cost $119 which is one of the cheaper ones available. I just needed a space Eliza can be in other than the mattress in the room. At least when she's on this, i'm not too worried if she decides to crawl off the mattress, or if she falls backwards from a sitting position. 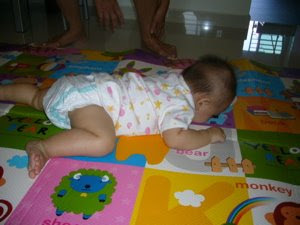 This is Eliza testing out the new playmat when it came...what else...taste it lah! the only problem comes when she sleeps. she'll roll all over her playpen and obviously roll towards the gap and sink in slightly. sometimes she'll sink in more and 'fall' into the gap. that was what happened last night. i couldn't find her in the middle of the playpen, only to find her crying for help at the gap cos she has rolled into it. Not really, Eliza's a ok sleeper. Just that it's so fun to play all the time sleep doesn't always come as top priority for her. Even when she's sleepy, and if i bring her out (cos we gotta go out during her nap time), she'll be so excited it keeps her awake. That's what we did over the weekend. 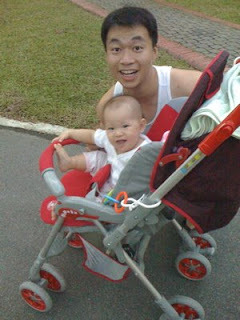 On saturday we took an evening walk to Bedok Reservoir and back instead of the boring shopping centres. We used her ol' stroller cos it could recline all the way, in case she slept on the way there (which i was hoping she would). Nah...fat hope. 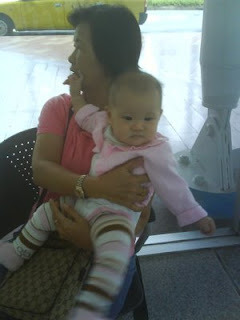 She was a happy gai-gai baby, sitting straight up and holding on to the stroller bar. On the way there she realized she could turn to look behind her and see us! 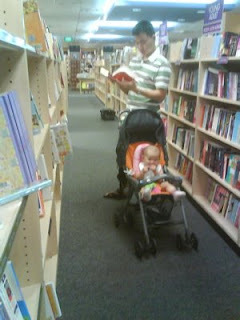 so she was laughing away, turning to look at us and trying to reach for the embroidered cartoon on the stroller. 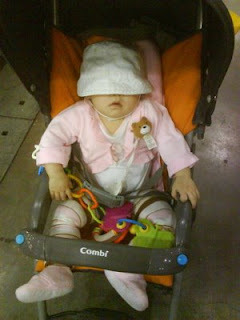 It was great and after all the fun and views she fell asleep on our walk back. I was hoping she would continue sleeping when we reached home at 8pm but she woke up the moment i carried her, and stepped into the our house, plus cheerful greetings from her grandparents...and she's raring to go again! she slept at 10pm. 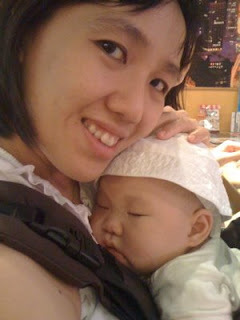 On sunday, we had dinner at TM and by the time we came home at about 745pm, she dozed off...albeit it was only 10mins. It was such a power nap she slept at 1030pm. Note that she woke up from her previous nap at about 3 or 4pm. Funny how i get particular with her sleep sometimes. I've taken it more lightly already and understand that babies, like us have our own sleep patterns. After all sometimes we sleep more, sometimes less. 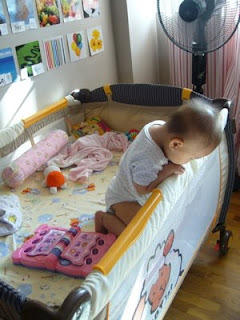 Eliza sleeps on her cot in the day time while at home. 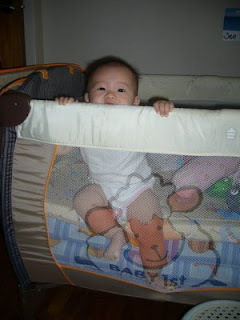 but at night, putting in her cot means she starts to crawl around, climb up and wants me to carry her. moreover, the cot aka playpen is lower now and it's tiring patting her to zz when she's on the other side of the cot. note: she rolls all over the place, this is what happens when your baby can move! 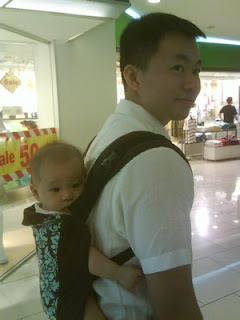 so i carry her and sing to her. but not always, as she will decided that something elsewhere is interesting and will try to move herself to that direction, or she will pull out her pacifier, swing it all around, and eventually throw it on the floor, after which she'll be peering out to look for it with mummy. oh my cheeky gal! if carrying doesn't work, i'll put her on my bed, let her roll around, and if she's tired enough, she'll doze off. i'll move her to her cot when she has her 10pm milk. (we skipped her before bedtime milk cos she obviously isn't hungry enough then). somewhere in the middle of the night she'll wake me sufficiently enough for me to decide that i have to bring her to our bed so i can have a better sleep. this early morning she was at the side of the bed, looking at me and calling out to me, or was she crying?, i can't remember. SO ever since i dunno when...she has been waking up in our bed in the morning. While we wonder how will we be able to wean her off our bed, we are enjoying this sleeping together thing, even Ww. He finds her so cute when she goes over to his side to touch his face, scratch him, or put her leg on him. after all don't we like to sleep with the people we love? This is the reason why i've been having relatively good night sleep nowadays. Buying clothes for Eliza is easier than buying clothes for myself. I need to do some shopping. Ww's saying i keep wearing the same clothes....geez. I should do a little personal shopping soon...AND stop trying to buy more clothes for Eliza. there's a few dresses waiting to be worn...waiting because it's still too big for her. 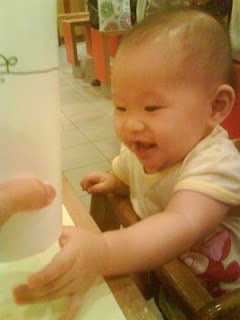 Ww's colleague is going to pass Eliza some clothes so more new clothes! :) and i should stop trying to look at the BP in the forums..makes me want to get more clothes for her. as it is...her clothes drawers are already quite full and she has some dresses hung where daddy's shirts are hung, Ww 'complains' on why it is taking up his clothes space. Ww mentioned that he saw Eliza 'scratching' miffy's belly button yesterday. i didn't know miffy has a belly button...maybe i'll check it out later. baby's fingers are always oh so cute! and i love watching her check out her toys or new things with her pointer finger...she'll use this tiny finger of hers to 'scratch' the object with quite some interest. 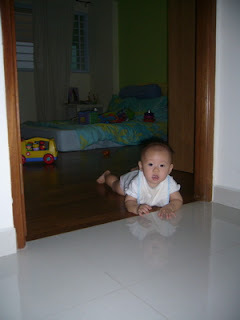 it's really interesting to see how our babies start to explore their world. and Eliza seems to have this "hmm...let's check it out..what is this?..." look on her face when she does it. came home after lunch potter around preparing purees and we had a nice long nap from 315-5pm. i sense that she sleeps much better with me beside her...and i secretly love co-sleeping with her...both of us sleep much much better. although i'm not sure if it's the same for daddy cos she'll love to sleep in the direction adjacent to us such that he legs will be on daddy's side, or she'll love to roll over to his side. the next time we buy a bed we should get a king sized one!! anyway it's lovely to wake up with her even though she's my alarm clock. her bio-clock wakes her up any time from 7-8am. geez so no waking up late for a long long time. but it's really nice to wake up with her and see her look inquisitively at me. sometimes i open my eyes to see her watching me...or trying to wake me up. she must be wondering why mummy's such a sleepyhead! I wish i can update stuff that we did each day (i reckon it'll get boring), but i don't have the luxury of time to. so i'll narrate with the photos. we did quite a bit of stuff last weekend and this weekend. 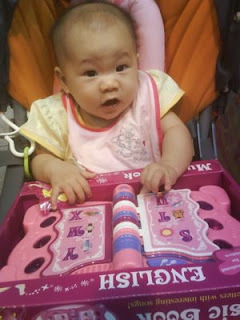 went to Taka with my mil to check out the toy fair, buy some clothes for me & Eliza. we went to Mos for lunch together...there was too many ppl at the food court and no high chair (i dunno..but i assumed) so we settled at somewhere convenient and with a high chair (nowadays it's so essential). she felt a little feverish when she woke actually and i was worried she would be sick again. sigh! checked out the toy fair...my mil put this for her to play cos it makes all kinds of sounds and when you turn the page, it has the 'flipping' page sound. it got Eliza all so excited (and good thing is that she didn't attempt to keep eating it), that my mil bought it for her. 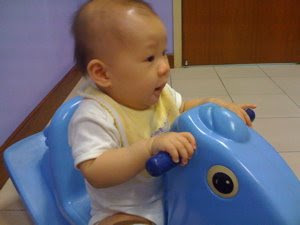 my sil came to join us too, to buy toys for her 3 boys (ok..sponsored by my mil) and we got a ride home...thank God. else i would have taken a cab. and we saw Miffy! Miffy is her bedtime stuffed toy...i'm not sure if she has any attachment to it but sometimes she holds miffy's ears to sleep...other times she will wave it around and throw it away...or chew on miffy's arms and legs. once she was rolling around trying to sleep, and she saw miffy, crawled to it, held on to it's ears and eventually fell asleep. 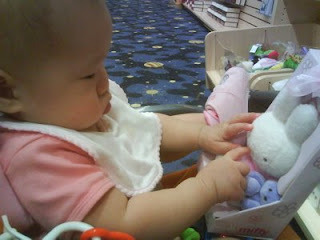 here's Eliza checking out miffy. 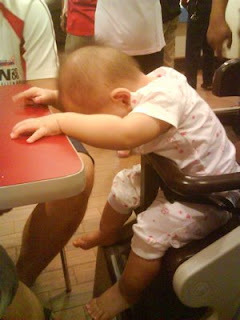 we went to Coffee Bean for coffee and Eliza for her milk and didn't have anywhere to go. so daddy suggested we walk to East Coast and it wasn't that far...and the walk was nice. 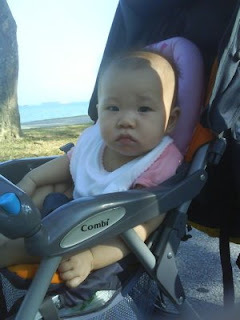 Eliza's also have a relaxing time, propping her legs up on her car and taking the view of the sea. as we walked on...she started to doze off...being driven around...the sea breeze in your hair..it's just too condusive for a nap.this is her after we tried to lean her back when she dozed off...it woke her up. but she was insistent on wanting to check out her surroundings (i suspect she must be trying to keep her eyes open but sleep overcame her eventually...). we had to 'push her back to lean down to sleep..
apples are fun fruits to play...you can grate them, give them in a slice, or as a whole apple it becomes a toy for your baby...this wasn't a particularly sweet apple and when i grated it Eliza wasn't too keen on eating. but when i gave a slice....she loves it. and this is Eliza with a whole apple...daddy is trying to clean her hair cos there was porridge stuck on it. and trying to get her to sleep is really not easy...even her bed is too exciting to sleep in. recently she has been doing this climbing and kneeling at her bedside...especially when she's looking for us. it's time to downgrade her! but because with the playpen aka her bed, once i remove the 2nd level it's very low and i can't reach her to pat her to sleep. so we lifted the mattress a little higher with more mattresses below. after cgl cell, we went for dinner. 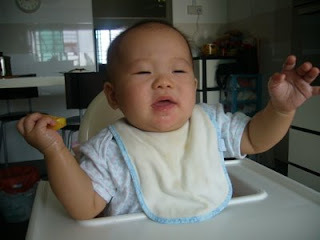 we wanted to eat zhi2cha4 at the round market and as we moved towards the table to sit...we smelt kfc. it was so powerful we went there to eat eventually. my mil & i made a short short trip to the metro sale at expo (with the help of Ww's dad driving us there at 230pm..and eventually driving us back at 430pm) there wasn't much, really. the borders book sale starts the next day..argh...missed it! Angelia & Amos came to visit...Eliza and Amos saying hi. can't tell how old Amos is from here hor...he's almost a long (or tall) as Eliza! 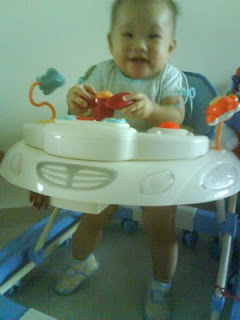 woohoo..he's growing really well! 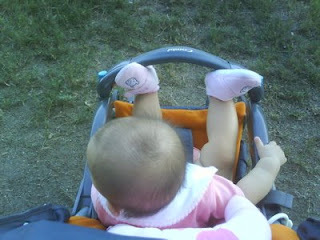 and Eliza was checking out his toes...wondering why it looks so much like hers. Eliza checking out her cousin's hair. 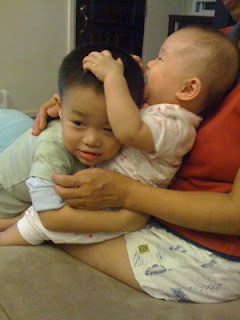 pulling it and having fun :P this lil cousin of hers loves to hug her...he's really nice to babies...very sweeeet. I'm finding Eliza more fun to play with...not that she isn't last time...it's just that she has grown up a lil more...and her joy and laughter is so resounding you just can't help feel happy being around her. and we do find her amusing too...not in a bad way but in an "you're-so-cute-and-i-enjoy-you" kind of way. - we love to watch Eliza sleep, sometimes she's funny, sometimes she just looks in such a bliss in her sleep, sometimes she looks like she's some superhero or what. too bad i can't take photos at night. sometimes she looks so cute, we'll call everyone to see. - Eliza responds. 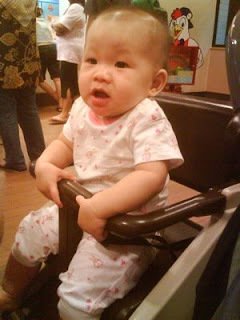 now she turns her head to her name, Eliza or Zhiling. Sometimes she'll "ay!" back at you. honestly sometimes i think she has more curious than other babies...seeking out any exciting new stuff to play and grab and eat..gosh! She's quite a handful because of this curiousity but i secretly love this part of her. - Eliza is a bundle of energy. a 15min ride home in the cab (when she's not sleeping) can help me burn as much calories as 15mins of swimming. sometimes i'm so exhausted but all the turning and attempts to grab (so i have to remove her from the point of interest), that getting out of that confined space is such a relief for me. good exercise for mummy yah..
when she wants something she'll stretch to get it, move herself over to get it, reach out to get it, turn to look behind her to see it. the move herself over to get it is really interesting for her ever since she can try walking with some support from us, we'll carry her on our lap and if she sees something she wants she'll arch her back so that she can get down from our lap, stretch her legs far and wide to attempt to move towards it. she'll have mummy & ah-ma anyday. 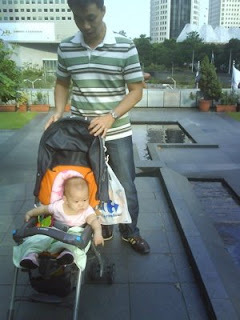 nowadays she's responding much better to daddy cos he plays with her & carries her more often. but with ah-gong....she'll "run" away! ie he's on the left and he'll attempt to carry her (we'll usually clap our hands twice and open out to her for an invitation to carry her..and say "bao4bao4"); and she'll either turn to the right and smile as if it's some play or she'll hop over to the right and try to get away...stretching her legs far and wide again! it's hilarious watching her do that. 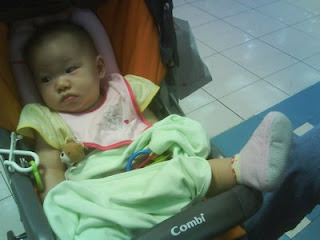 sometimes she'll ponder for a while as to whether she'll want to change carrier. All in all it's really a joy to see her grow. 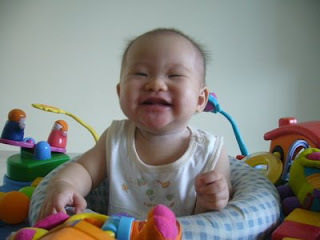 i give you my "eeee" smile!